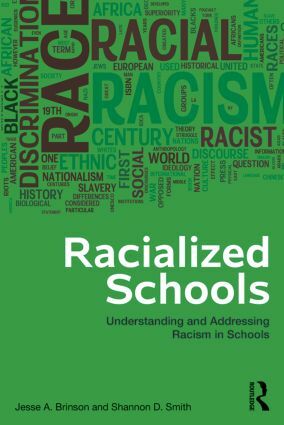 "In a single, succinct, tightly organized text, school psychologists Jesse Brinson and Shannon Smith—faculty members of the CACREP-approved school psychology program at UNLV—present a comprehensive overview of how race and racism operate in modern schools. The text will engage teachers, guidance counselors, and general K-12 school personnel." "In an increasingly diverse society and student population, it is critical that school personnel are cognizant of their conscious and nonconscious biases and expectations and that these professionals are keenly aware of the ways in which these tendencies may be interpreted as racist. This book is a must-have resource for education professionals, both preservice and inservice. It sheds great insight and provides excellent practical examples that administrators, teachers, and school counselors could use to improve their effectiveness with students of color." "Racialized Schools is a significant and timely contribution. This text ensures that professional educators, university trainers, government officials and mental-health practitioners have the resources to address racism within education and beyond. Moreover, the national survey utilized to gather important facts from those involved in the educational enterprise provides rich evidence of the need to focus on this topic from a federal, state, and local policy and curriculum level. The authors present numerous examples of their abilities to provide enlightening analyses of race in the schools through illustrations, case studies, and their lived experiences. I highly recommend this fresh, direct, and clear approach to an intractable issue." Jesse A. Brinson, EdD, is a professor of counselor education at the University of Nevada–Las Vegas and specializes in understanding race and racism in U.S. society. Dr. Brinson’s scholarship is published in major counseling journals and seeks to help U.S. citizens develop non-racist self-identities. He is the recipient of the Rosa Parks Faculty Award for pursuing a career in higher education. Shannon D. Smith, PhD, is a professor of counselor education at the University of Nevada–Las Vegas. He is a licensed professional counselor and supervisor in Nevada and Ohio. His current research and practice interests include multicultural issues, advocacy for underrepresented groups, and racial conflict resolution in schools and communities. He has published numerous refereed journal articles, book chapters, and scholarly works and has served on various state and national associations, as well as editorial boards, including the Journal of Counseling & Development.